HOW DOES YOUR GARDEN STACK UP FOR LATE-SUMMER BLOOMS? I’ll admit my own beds are more colorful in April than August. 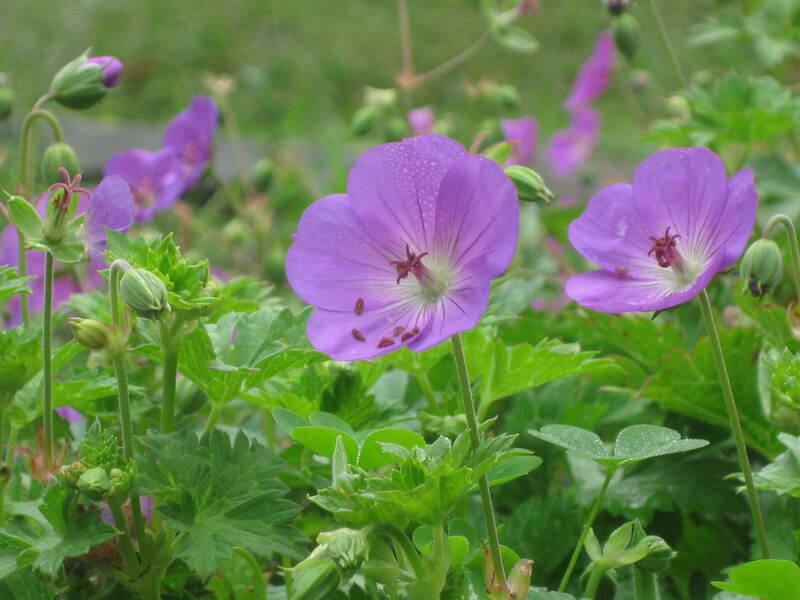 Still, the flowers which do emerge at this time — like the cranesbill geranium above — are choice. Would you like to see them? 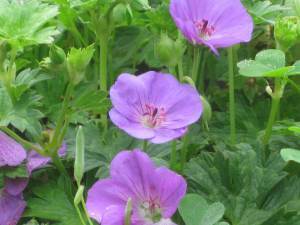 ‘Rozanne’ is probably the loveliest of all cranesbill geraniums. I have it next to the top steps in the Serpentine Garden, where it thrives in full sun and well drained soil. The violet-blue blooms continue from mid-July through at least the end of October if faded flowers are promptly removed. Rozanne’s medium-green leaves turn brilliant-red in fall. After the ground freezes solidly, I apply a 2-inch mulch beneath, not above, the plant’s foliage. Hardy zones 5-7. Hydrangea paniculata makes a striking display in August. This is when clusters of snow-white bloom appear at the tips of graceful, arching stems. ‘Chantilly Lace,’ above, prospers here in full sun from its perch atop a stone wall. To keep this paniculata within bounds — it can grow to 13 feet — I prune it back severely in February. The shrub is extremely drought-tolerant. It is a reliable perennial for zones 4-7. 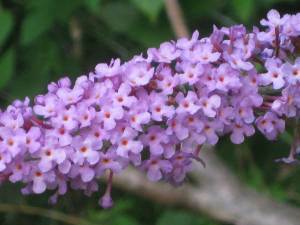 Lately I’ve enjoyed sitting on a bench in the Serpentine Garden, beneath the shade of a Yoshino Cherry tree, where I can comfortably observe all the beautiful insects which visit Buddleja davidii ‘Dubonnet.’ This purple “Butterfly Bush” attracts butterflies, bees, moths and almost every other flying and buzzing creature you can imagine. The 14-inch long, sweetly-scented cones are ideal for cutting. Although I prune the shrub back to 24 inches in late October, it never fails to reclaim its stunning, 8-foot stature by late June. If you have room for this drought-tolerant, disease-free perennial in your garden, be sure to obtain one. It is hardy in zones 5-9. 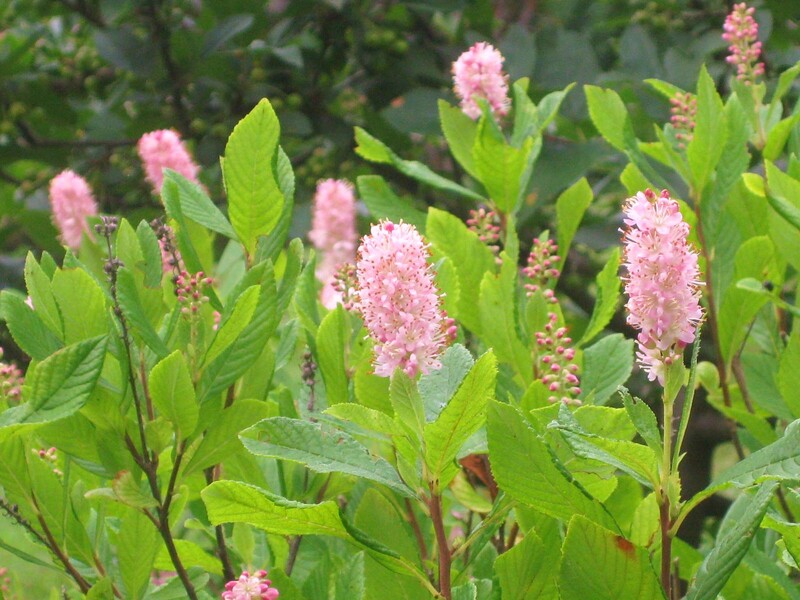 Irresistible too is Clethra alnifolia ‘Pink Spires.’ In August, this spreading, upright shrub sends up dainty candles of creamy-pink bloom. These have so strong a sweetness, almost like Linden flowers, that the fragrance spreads for hundreds of feet. I enjoy its perfume especially in the evening, when the honeyed air wafts through my open windows. 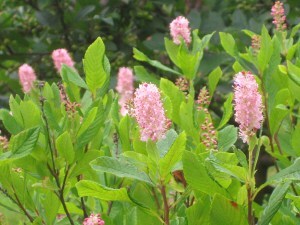 Although clethra prefers moist soil and part shade — it is really a woodland plant — it has performed well here in full sun and fairly dry soil. To learn more about this perfect perennial, read this profile. Stealing the late-summer show in a small, partly-shaded perennial bed located between my Kitchen and Woodland gardens, is a trio of Digitalis purpurea ‘Camelot Rose.’ These “foxgloves” came from seeds I winter-sowed back in January, 2010. Bumble bees and hummingbirds love purpurea’s speckled, maroon trumpets as much as I do. What I don’t love are the weak, 2-foot tall flowering stalks. These inevitably collapse in wind and rain. If you grow Digitalis, be sure to stake the plants early on. Of course there are plenty of evening-scented Nicotianas which bloom here in late-summer, too. But let’s talk about your garden. Which flowers bring color (and possibly scent) to your world in August? Kevin, how I envy all those flowers of yours! I'm new to gardening, but this June, I had breathtaking shirley poppies, and I read on a seed site you linked that you can plant poppy the second time in a growing season. Since it took about six weeks for my shirley poppies to bloom, I recently sowed seeds again (after mixing them with sand and compost, watering them and putting in the freezer for several days) and now I have new seedlings! I don't know how they will pan out and whether they will bloom in September. But the whole point is, I want to experiment and to see! 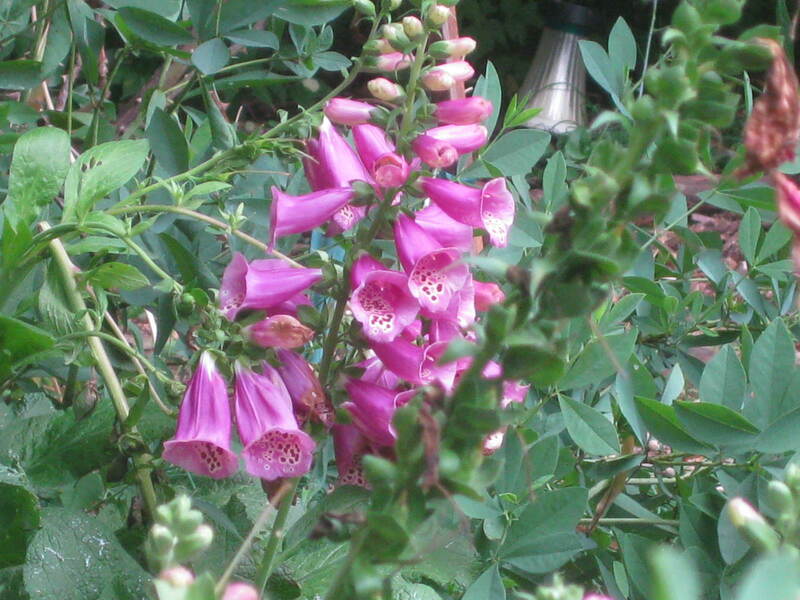 I have a lot foxglove seedlings now and am looking forward to blooms next spring. But I am going to winter-sow this January just like you did to have later bloom too. Again, thanks for the tip. You don't know how comforting it is to come here and always find something to learn. Right now, unfortunately I only have cosmos and blue sage in my patch. Plus a gaura plant. I tend to grow perrenials instead of annuals. I do have some annuals in my porch pots. Most of our flowers are on trees that are drought and heat tolerant. Yaxue – If the weather cooperates, you might indeed get an autumn show from your Shirley poppies. You can winter-sow them, too. You are lucky to have a guara plant! The Japanese Redneck – You are lucky in a zone where trees bloom in August. Can't think of any late-flowering trees in my area. Perennials in bloom at this time in my backyard: Heuchera, Hydrangea, Butterfly Bush, Hardy Hibiscus, Rudbeckia, Dahlia, Lavender, Echinacea, some late-season Daylilies wrapping up their show and Stellas re-blooming, a couple of Hostas that send up fragrant white flowers, and the Roses are sending up buds. The show stoppers at this time of year are my roses of sharon. I have 2 as bushes on the side of my house (one white, the other purple) and a blue at the front of the house as a topiary tree. My green hydrangea at the back is blooming wonderfully-the regular one in front, not so much. I still have a few daylilies blooming-they didn't do that well this year. That's about it for my flowers. Patty in zone 5 – Your backyard must be very colorful at this time. And thanks for the reminder — I need to find some August-blooming daylilies (my scented yellow ones finish in early August). Katreader – In an earlier comment, I mentioned I couldn't think of any late-blooming trees for this zone. Of course…Rose of Sharon. Your collection sounds exquisite. The Casablanca lilies are totally stealng the show now with their size and scent, cardinal flowers just starting, waiting on helenium and hibiscus… but nothing like July's amazing show. It's definitely looking a little tired out there and so am I! Looking forward to vacation next week! In my primary flower bed I have coreopsis, brown-eyed Susan, butterfly bush, coneflower, gladiolas, knock-out roses and rose of Sharon all blooming now. I also have several low and tall annuals to maintain the shape and color (mostly purple and yellow) so I have verbenum, ageratum, petunias, cosmos, white geraniums, sunflowers and zinnias. On either side of the stairs leading down to the garden I have climbing beans and nasturtium, both with orange-red flowers. I have a second bed with gooseneck, phlox and lady bells that's still going strong, but I'm cutting those back since they're invasive. BBI – Are you in a slightly colder zone than me? I only ask because my lilies – including Casablanca – came and went in July. Enjoy your vacation! Welcome, Erica. Sounds like your garden is a treasure-trove of color in August. Purples and yellows are my favorites, too. Thanks, Kevin. We're up on a ridge, so our micro-climate here is consistently 5 degrees cooler than even just down the hill. A very knowledgeable nursery worker told me that I may actually be zone 4b. I seriously almost cried in the car on the way home! I have since come to terms with it and I have to say that when summers are as hot as this one has been, I'm really grateful to be where I am. The lupines heartily agree! [Zone 6B here!] 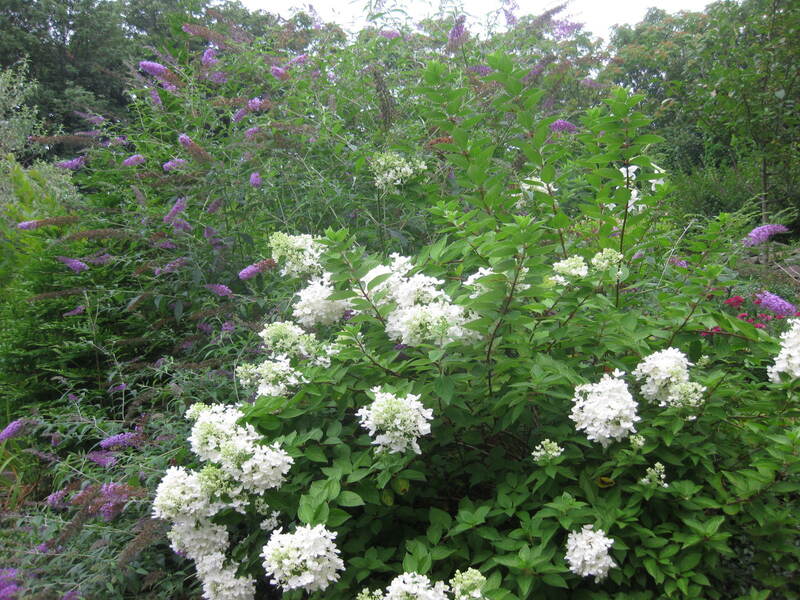 I am looking into that shrub, the “Clethra Alnifolia” intensely… the idea of a heavenly scented shrub that will grow well in shade? Oh yes, oh yesss… Planning for my side yard part-shade garden commences! I think the show-stealers are my plentiful 4'o'Clocks. I love them dearly. Also have Joe pye weed, malva and obedient plant blooming now. I really focused on having a show stopping flower garden for july and august. Things start winding down when school starts which is good for me since I'm a teacher, but i'll be sad to see it come to an end…When is the best time to pot up annuals like begonias and geraniums? BBI – Well, if, in August, lupines continue their colorful show…you are lucky indeed! Donna B. – I not only grow Clethra, I worship Clethra! You will love the shrub's intensely fragrant candles too, in the partly-shaded side-garden you mentioned. Erica – You were wise to plant your garden for July and August color. What nice selections you have! 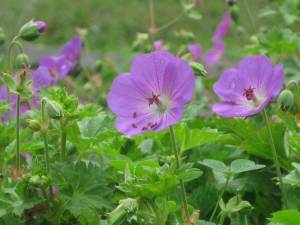 Now is a good time to prepare geraniums and begonias for winter. If you don't wish to lift the plants (which involves messy root surgery) consider taking cuttings. You will find tips for overwintering these plants here and also here. Nice,Lovely,beautiful and really heart touching Flowers!! Kevin, some of my first year lupine bloomed out of season this year (July). I just meant that my flowers in general seem to last longer with our slightly cooler temps. Sunflowers don't like it much here though!